Kurt Angle has accomplished just about everything he can in the world of professional wrestling. He started his career wrestling in college before tasting Olympic glory. When the WWE came calling he answered and helped introduce a new generation to the the soap opera that is World Wrestling Entertainment. These days, he lives a cushy life as a WWE general manager, only making brief ring appearances when needed. To reach the peak of his career, Angle had to overcome incredible hardships in his life. This is the story of everything Kurt Angle battled through to find himself at the top of the mountain. You won’t believe what injury Angle fought through to win gold at the Olympics! 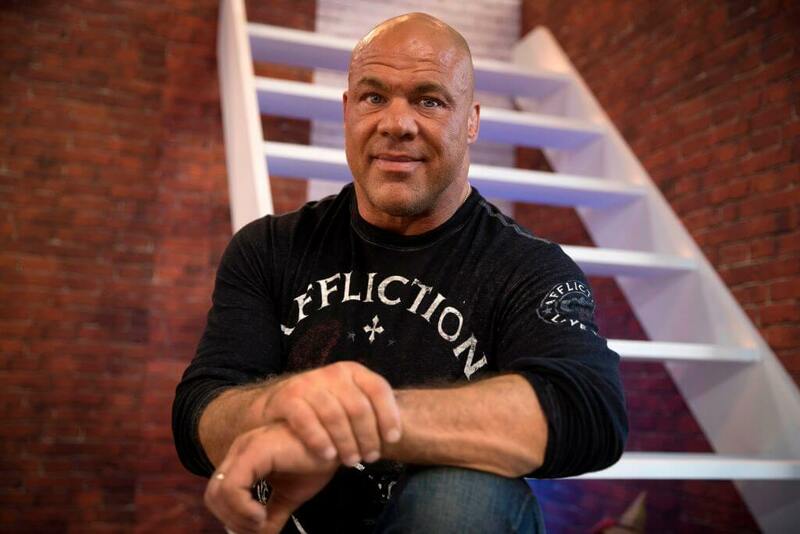 Growing up, Kurt Angle’s father made sure his son knew how much he loved him. Despite working a job as a crane operator with long hours, David Angle never missed one of his son’s football games or wrestling matches. 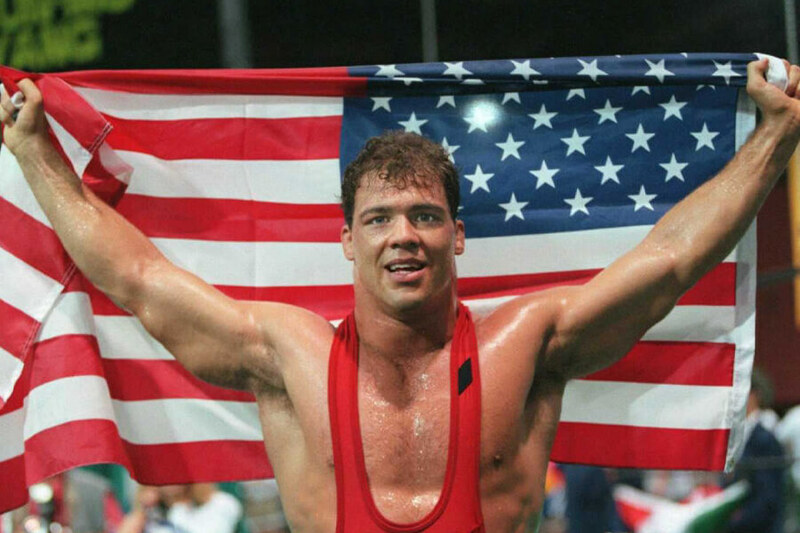 Kurt Angle was a star athlete growing up, and his father could not have been more proud of his son. Sadly, when Kurt was 16 years old, tragedy struck and his life would change forever. The heartbreaking loss of his father would shape the man he would become. To support his family, David Angle spent his life as a crane operator. 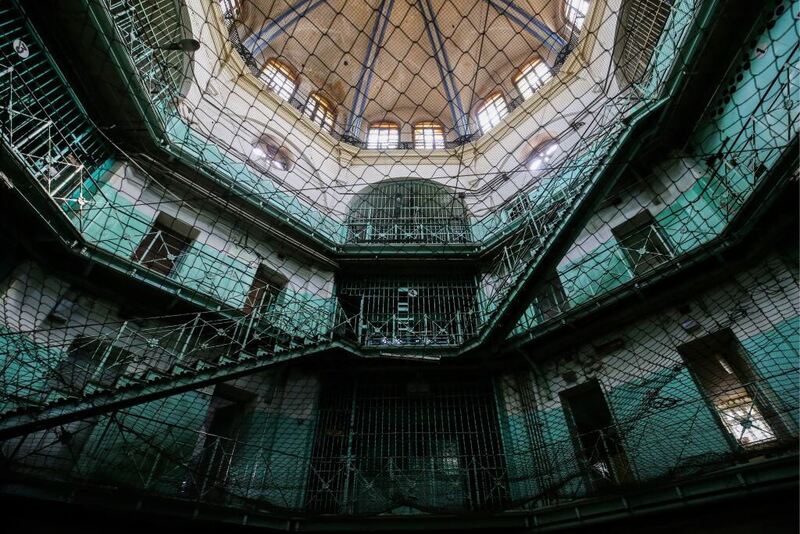 When he fell out of a 15-foot high crane in 1985, everything changed for his family. Angle reportedly got up from the accident and walked himself to the hospital. At the hospital, he went into a coma and passed away. The loss affected Kurt deeply. His life would never be the same. When he heard the news of his father’s death he had to decide for himself how to carry on. Up next, how Kurt turned the negative into a positive. The same week Angle lost his father, he had his best performance on the football field. He focused his life on sports entirely. You might even say the death of his father, tragic as it was, turned Kurt Angle into the man we see today. One of the biggest boosts Kurt Angle got in his early career was the ability to train with Team Foxcatcher under coach David Schultz. Schultz had won Gold in the Olympics in 1984 and worked to prep Angle for the 1996 games. At the 1996 games, Angle was the lone representative of Team Foxcatcher. We’ll talk about why on the next slide. The young wrestler stunned the athletic world when he got gold despite playing with a brutal injury. 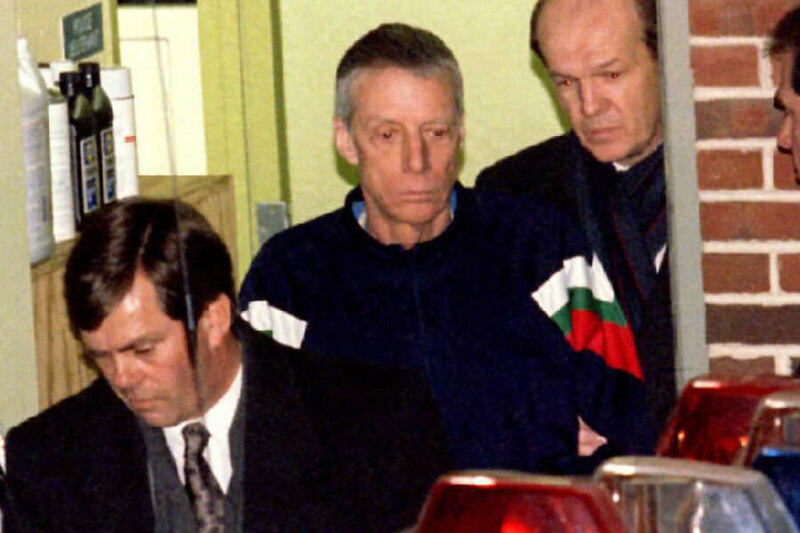 The reason Kurt Angle was the lone representative for Team Foxcatcher was because of John Du Pont, the team’s philanthropist owner. Du Pont struggled with paranoia and schizophrenia and would often threaten wrestlers and coaches with weapons. 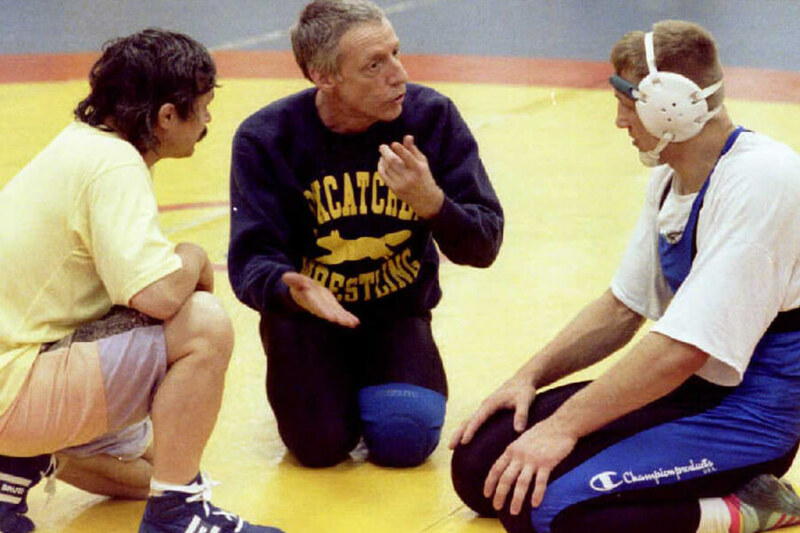 Things went too far on January 26th, 1996, when Du Pont took the life of David Schultz. He was sentenced to 30 years in prison. 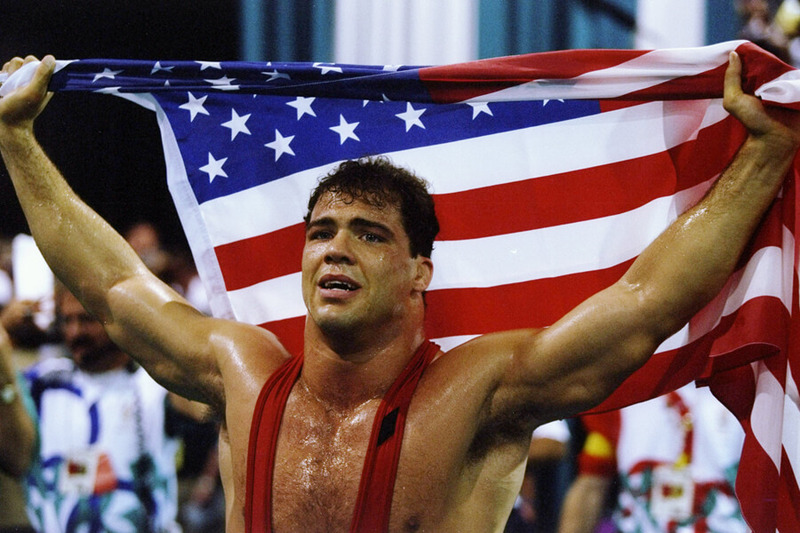 Kurt Angle vowed to honor the life of Schultz at the Olympics, overcoming the odds to win gold. Up next, the odds were the only thing Kurt Angle had to beat to win Olympic gold! Not only was Kurt Angle battling extreme emotional anguish during the Olympics, he was also wrestling with a broken neck. The injury occurred during trials, when Angle landed wrong on his head, herniating two discs in his neck. Determined to compete, Angle jumped from doctor to doctor until he found one that cleared him for competition. The only requirement was that he take strong painkillers before any match. The plan worked, although the use of drugs would end up having a devastating impact on his life. 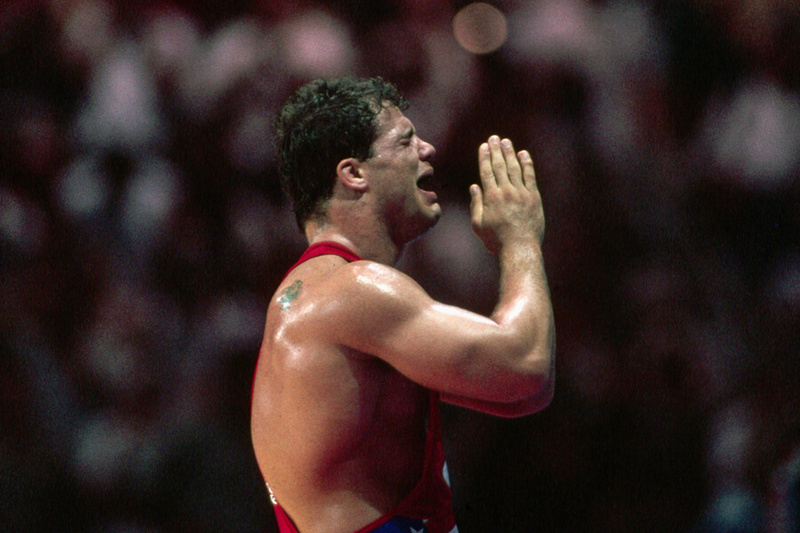 As a result of his determination to wrestle in the 1996 Olympics, Angle found himself addicted to painkillers. At his worst, the wrestler admitted he was taking 65 pills a day, mixing a cocktail of several varieties. He says his addiction helped him wrestle through multiple broken necks. The more his body broke, the more prescriptions he’d get from doctors. Eventually, Angle realized he had a problem and made a promise to himself he would get clean and sober. 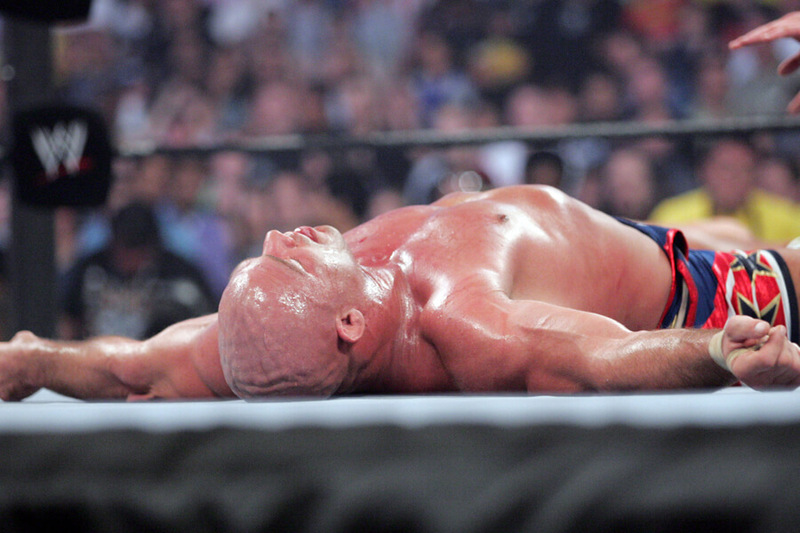 Kurt Angle finally went clean after suffering several injuries in one match in 2005. Instead of avoiding the pain with medicine, he refused to take anything. His promise to himself to stay clean lasted for at least a year. During that time, Angle told the Tribune-Review he was working on cleaning up his entire life. Try as he might, going cold turkey is never easy. After a few years, Angle was self medicating again. This new battle wouldn’t be so easy to overcome. Next, found out what made Angle go clean for good. 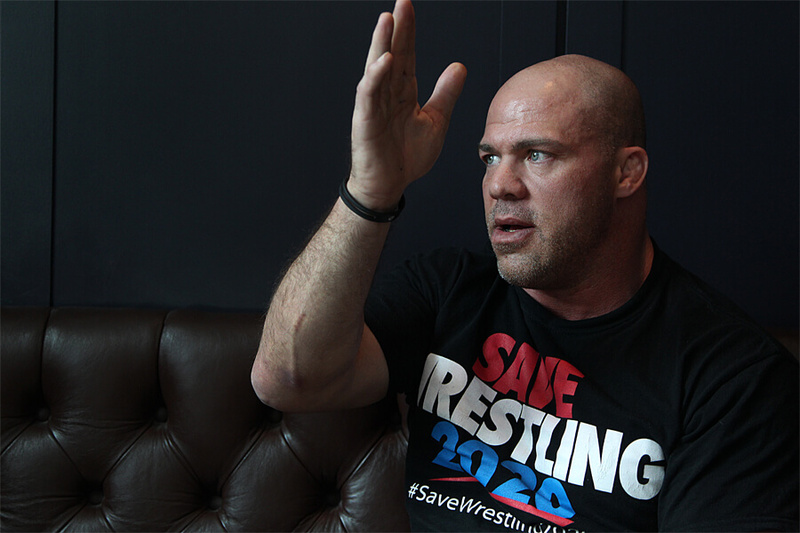 In 2014, Angle did an interview for CBS revealing he was one year clean after a seven-year battle with drugs and alcohol. His cocktail of choice was a mix of things we won’t repeat here. For the first time in his life, Angle felt like he was finally winning his battle with addiction. The key for him now is to keep fighting. The temptation will always be there, and it’s up to him to continue saying no. 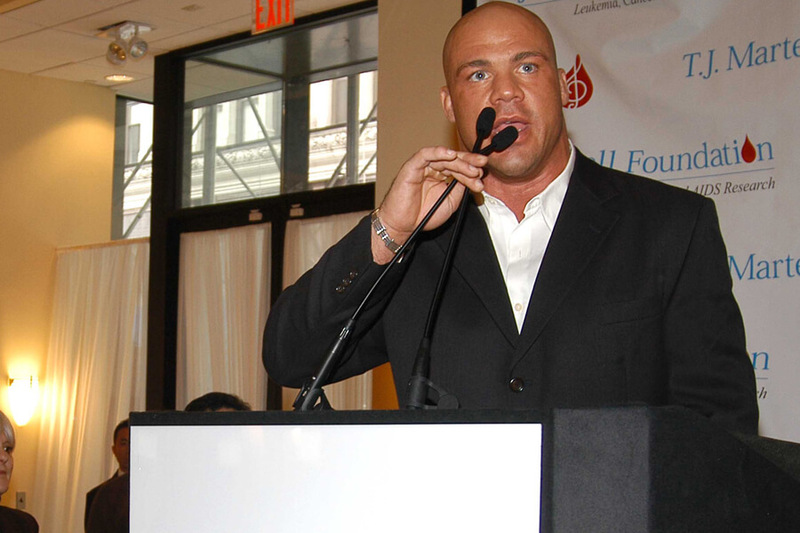 Kurt Angle signed an eight-year deal with WWE in 1998. The contract marked his transition from Olympic wrestler to performer. Two years before signing with WWE, he actually turned down another offer from them. The company’s original offer was for one million dollars. The offer came directly after he won gold. He had no interest in becoming a performer for Pro Wrestling at the time. It didn’t take long for him to have a change of heart, and he’s probably glad he did. 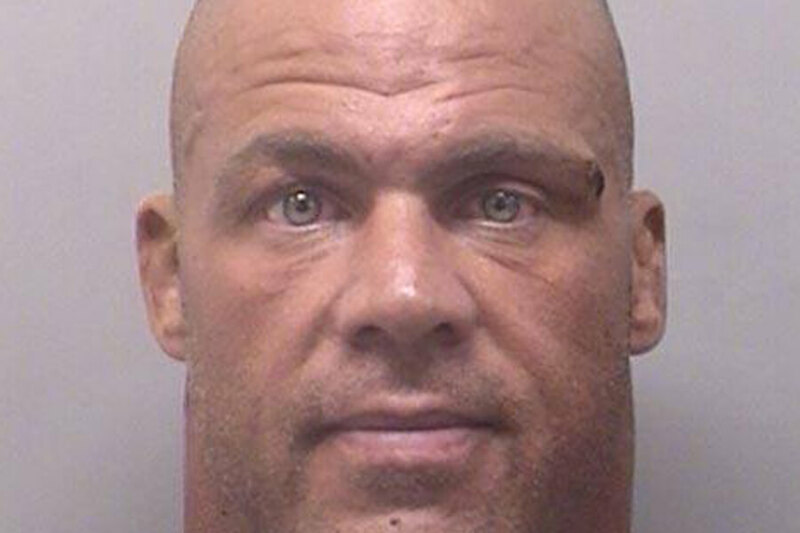 Dealing with addiction isn’t easy, and during the years he was self-medicating, Kurt Angle was arrested four times for driving under the influence. The first arrest came in 2008, when a Pennsylvania woman reported him for almost hitting her while leaving a bar. Angle’s fourth DUI came in 2013 after a TNA show. Cops pulled him over and arrested him for reckless driving. After the arrest, Angle took to social media to reveal he was going to rehab. 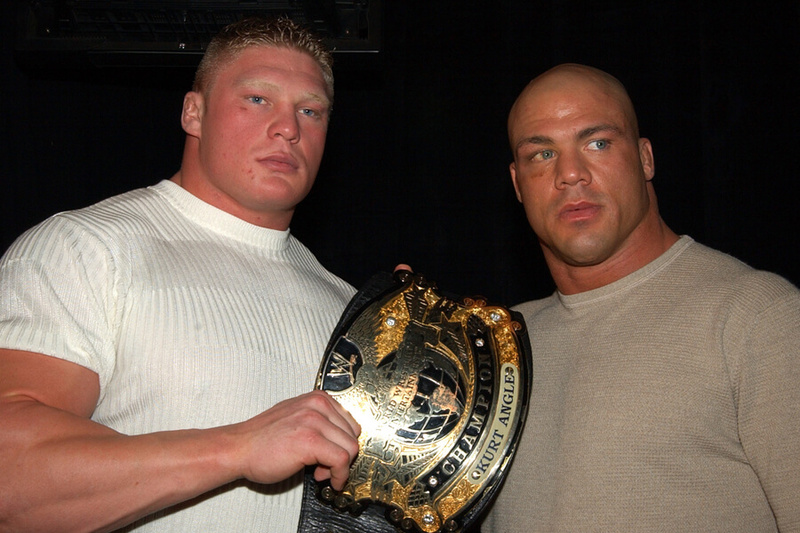 When Kurt Angle joined WWE, his relationship with Vince McMahon became familial. For the man who had lost so much, he began to view the owner of the company as a father figure. In a WWE 24 documentary, Angle said, “Vince and I had a connection. He wasn’t just a boss. He was a friend, a father figure, and I actually loved him. I loved him like a father.” When Angle left WWE in 2006 to go to TNA, leaving McMahon was one of the hardest things he ever had to do. Find out why Angle left WWE next! 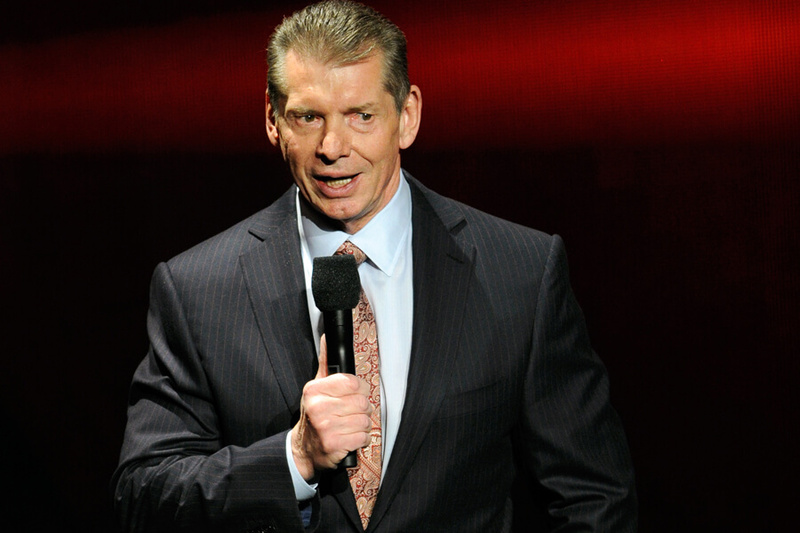 A rift formed between Angle and McMahon over the wrestler’s upcoming Wrestlemania performance. Angle was recovering from a broken neck and McMahon didn’t want him to perform. Angle refused to listen, convincing McMahon he was okay. Shortly after, Angle angrily left WWE for TNA. 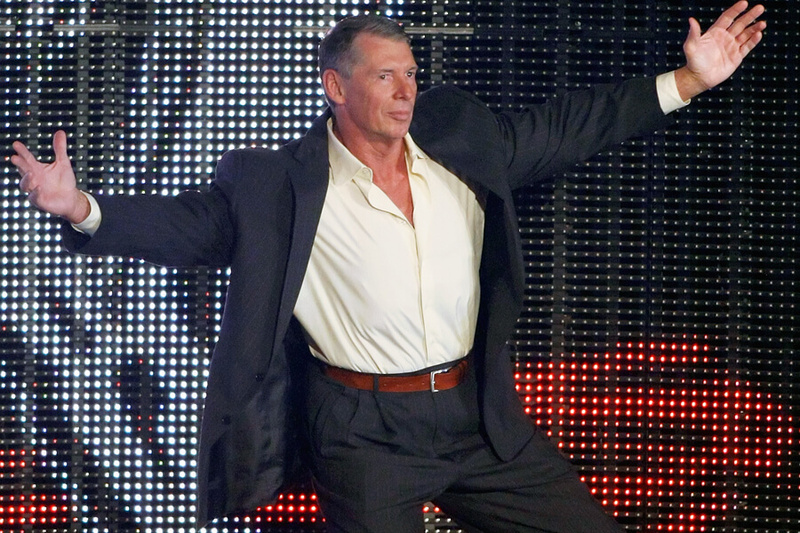 McMahon was worried about his addiction problem and Angle didn’t want to feel like a burden. On TNA, he was able to nurse his addiction without judgment but always longed to come home. In 2017, clean and sober, he made his glorious WWE return. Two years after leaving WWE to join TNA, Kurt Angle and his wife, Karen, divorced. When Karen found her next love, it happened to be Angle’s boss and co-owner of TNA, Jeff Jarrett. At the time, Angle had a feud storyline going with Jarrett, and his emotions were more raw than planned. He knew about the relationship before it went public, and used it to focus his performance. In 2012, Kurt married actress Giovanna Yannotti. Still ahead, the scandal that almost ended Angle’s career. In 2007, Sports Illustrated published an report implicating Angle in a massive steroid scandal that could have ruined his career. Angle defended himself, revealing he needed steroids to help recover his broken neck. He insisted he wanted to get them legally, but his doctor went around him and ordered them illegally online. The doctor was found guilty of supplying athletes with steroids meant for use on animals. He was sentenced to four years in prison. Angle maintains his ignorance about the operation today. 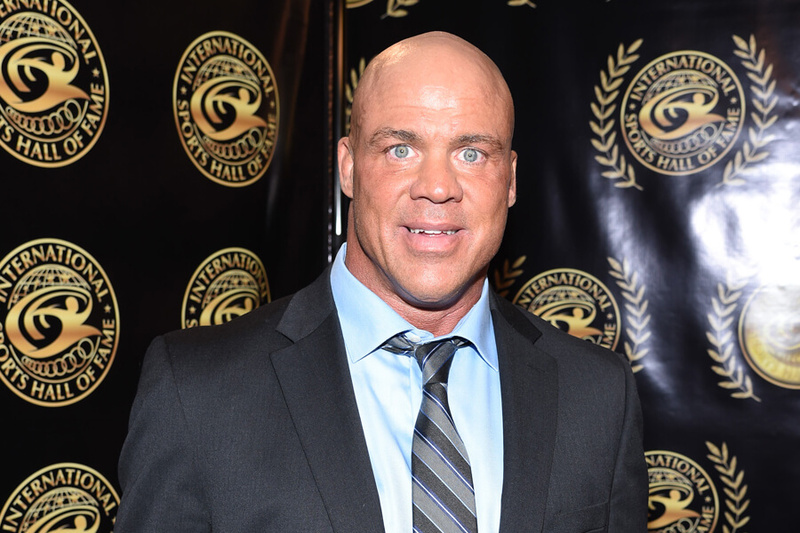 Kurt Angle’s family has a history with the heart disease angina. Overall, 14 of Angle’s relatives have been afflicted with heart problems. Since becoming a celebrity, Angle had fought to bring awareness to heart disease. In a 2003 interview he said, “My sister had a heart attack at age 41, my dad had two heart attacks before he was 55.” Maybe focusing on his physical fitness was one way Angle tried to avoid the same fate. When Angle was at his early peak with WWE, he was a heel (villain). Because of his persona, WWE refused to let Angle do “heartwarming stuff.” After spending a lifetime watching his family suffer from heart disease, Angle was told he couldn’t fight for them. Of course, Angle still did everything he could to show how dangerous heart disease was. He just couldn’t do it too publicly. These days, WWE is less concerned about the causes their wrestler’ support and how it might affect their reputations. Working for TNA was not a good time for Kurt Angle. Not only was his ex-wife married to his new boss, but one of his fellow wrestlers, Rhaka Khan, accused him of harassment. The female wrestles filed a PFA (protection from abuse) order in 2009, and Angle was arrested. In November that year, Khan dropped the PFA, settling for a civil agreement for three years where the two could not see each other for three years unless work was involved. As if losing his father at 16 years old to a freak accident wasn’t enough, Angle revealed in 2014 that his sister died of a drug overdose in 2003. One day after her passing, he fought Brock Lesnar in a one hour match. David Angle Jr. was arrested in 2015 after he called 911 to report his wife was unconscious. He told police that the two got into a fight that ended his his knee in her chest. Donna passed away and Angle was charged with homicide. In 2016, David plead guilty to involuntary manslaughter and sentenced to ten years in prison. After overcoming so much tragedy in his life, we can’t imagine how Kurt took the news of his brother’s conviction.